Prevent harmful cut and puncture injuries with Cut Protection products. 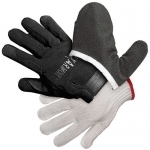 Cut Gloves and HexArmor® Gloves will prevent cut and puncture injuries during a variety of kitchen tasks. Designed to significantly reduce the risk of cut injuries in the food service industry, Cut Protection products are a simple investment in maintaining the safety of an establishment. 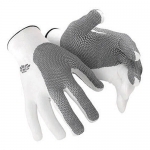 The Cut Glove Display Sign is a great way to keep kitchen cut gloves clean, organized and highly visible for employees.